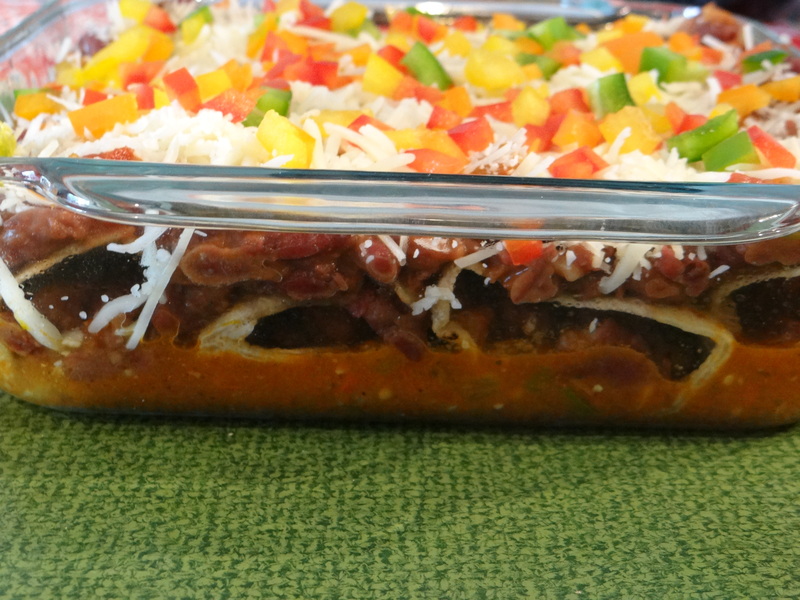 Enchiladas are one of our family favorites. 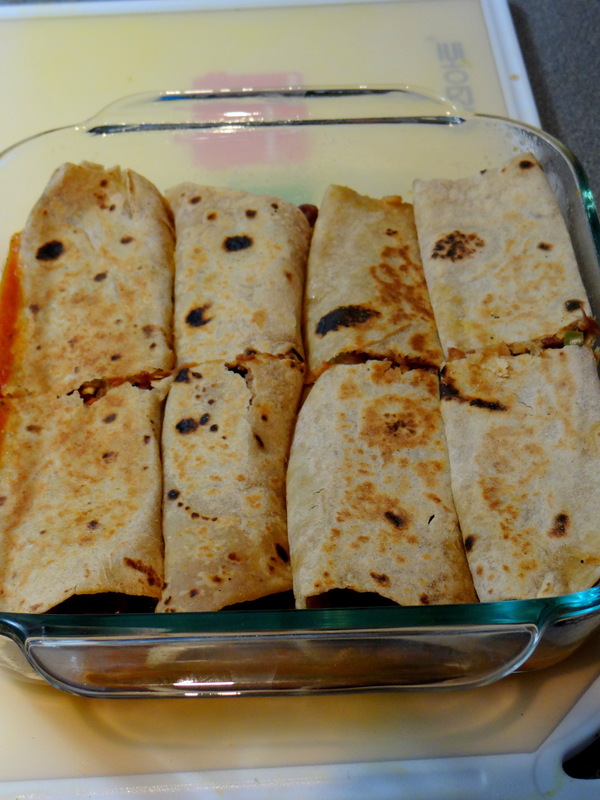 Traditional enchiladas are made with corn tortillas, mexican salsa sauce, refried beans and cheese. I do love the ethnic flavors in this Mexican classic but this time I wanted to try something different and make it with an Indian twist. This is my version of Roti Bean Enchiladas made with Rajma Masala (red kidney beans cooked with Indian spices) and homemade Rotis (Indian flat bread). 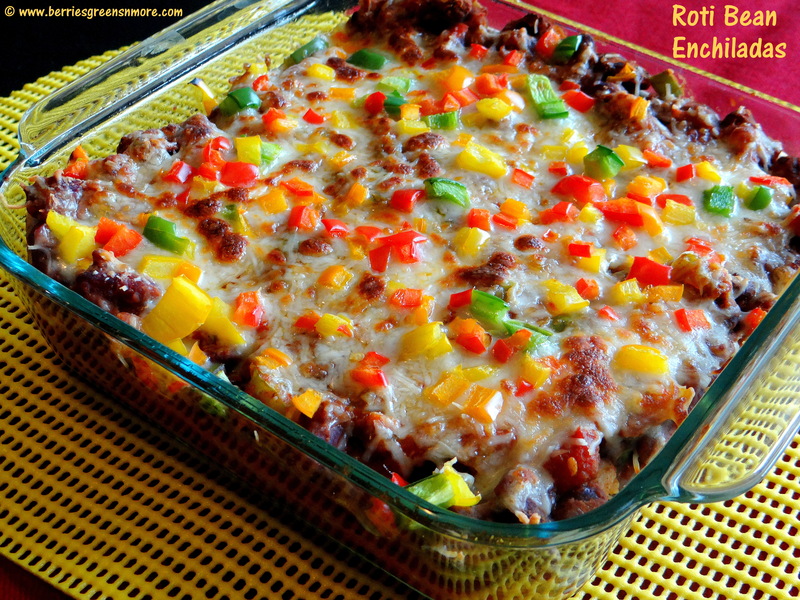 This “Mexi-Indian” fusion dish is very flavorful and very very delicious!! I hope this recipe will start the trend of fusion cooking from the best of the two of the oldest cultures of the world. So, let’s start cooking !! 1. In a deep bottom pan, add the olive oil and when hot add the minced garlic, onions, ½ cup chopped bell peppers and stir fry for 2 to 3 minutes. 2. 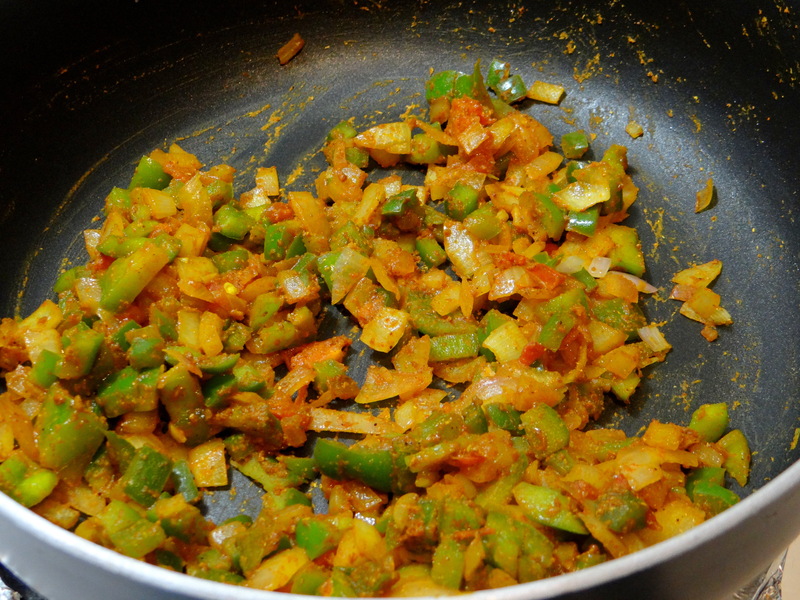 Now, add the tomato puree and the dry masala powder and cook for 5 minutes. 3. 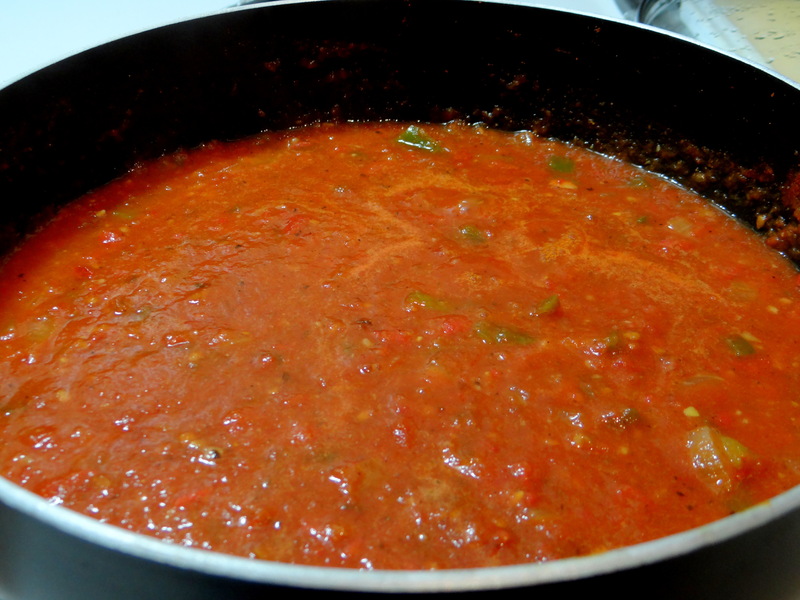 Keep aside ½ of the prepared tomato sauce. 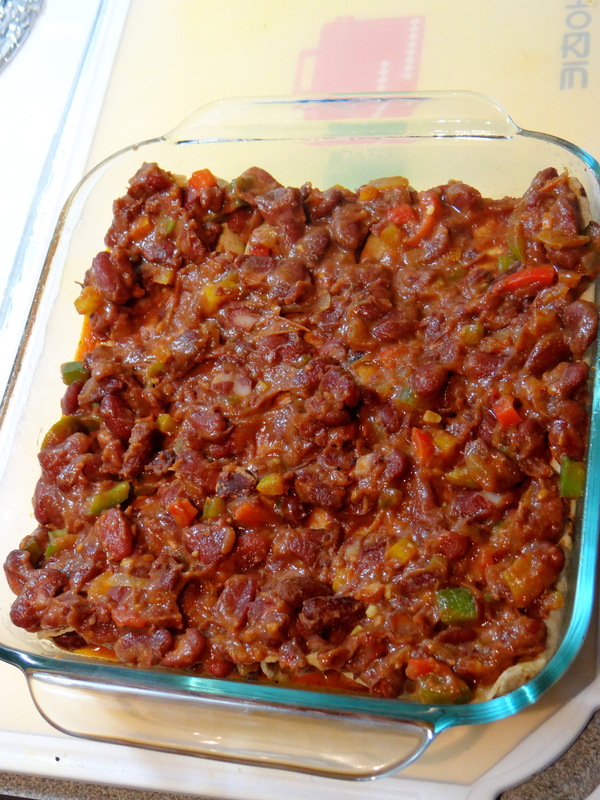 In the remaining sauce add the rajma beans and ½ cup chopped bell peppers and mix well. 5. 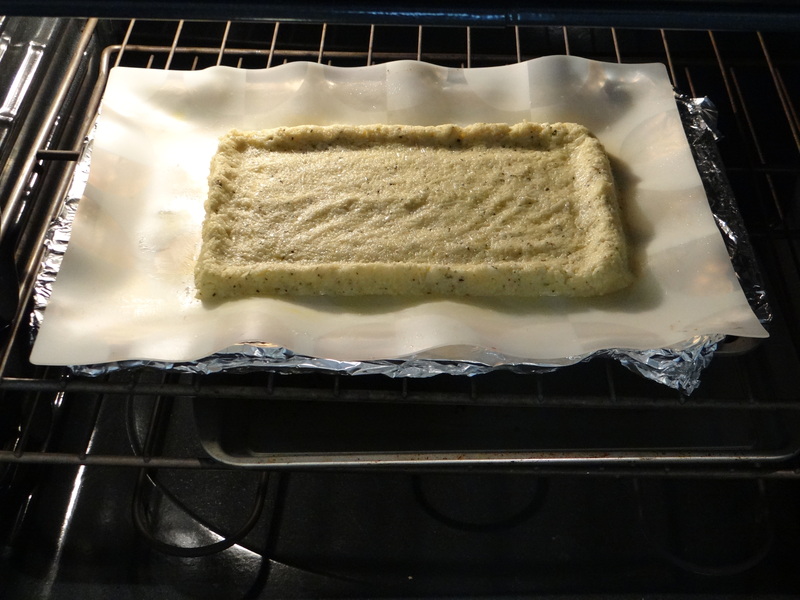 Coat an oven proof 13 x 9 inch glass or ceramic baking dish with some cooking oil spray. 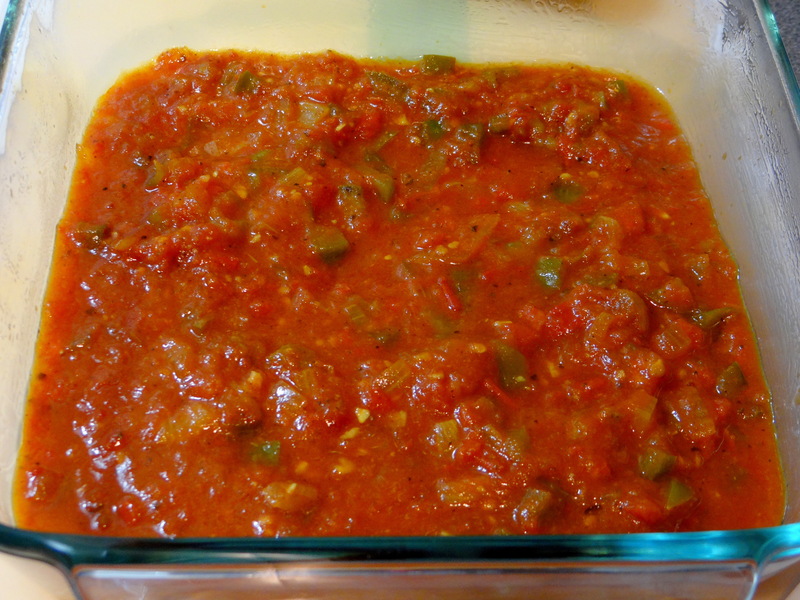 Spread the prepared sauce in the bottom of the dish. 6. Spoon 3 tablespoons bean mixture down center of each tortilla and roll up. 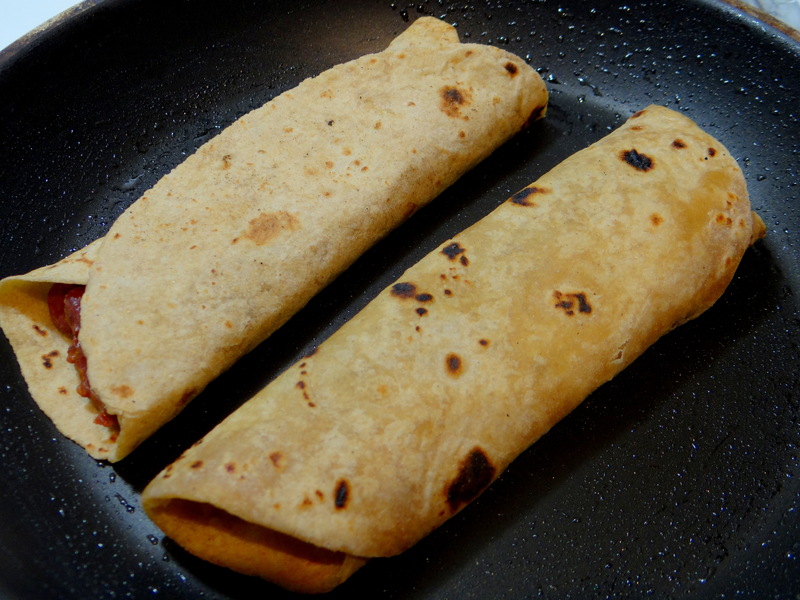 Toast the rolls on a non-stick pan with 1 teaspoon of oil till light brown on both sides.When the rolls are toasted, they retain their shape and do not become soggy. 7. 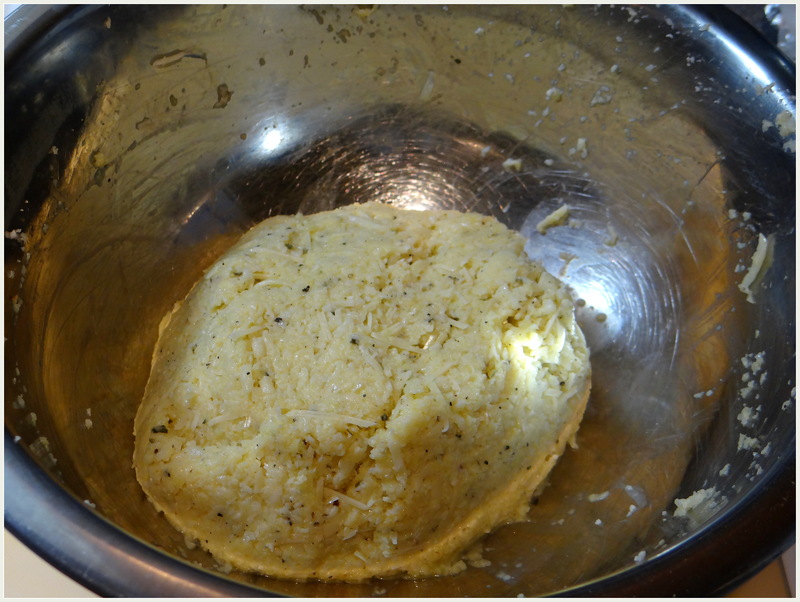 Now, place seam-side (opening side) of the rolls down, in prepared dish of sauce. Cut the rolls in the center for easy serving. 8. Spread the remaining bean mixture on top of the rolls. 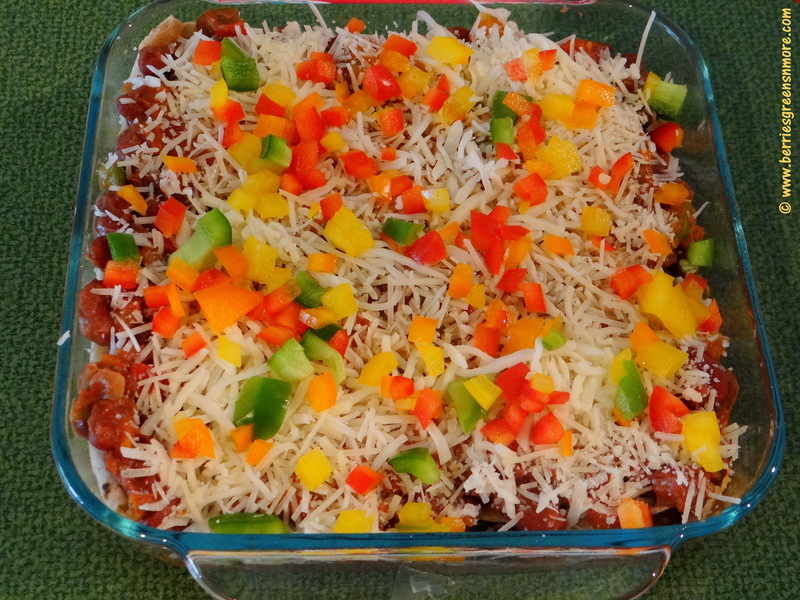 Top it up with grated cheese and garnish with colored bell peppers. 9. 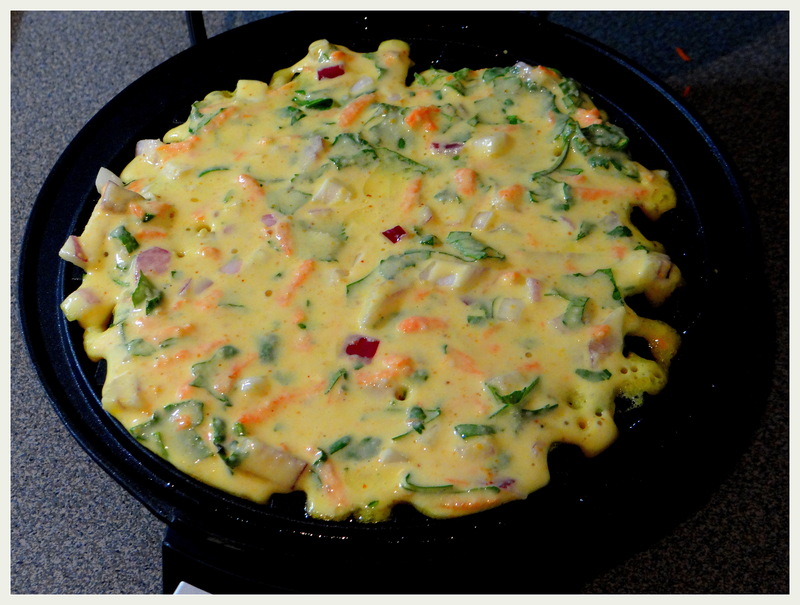 Bake the dish for 15 minutes or until the cheese is golden and melted completely. 10. Once done, remove from the oven. 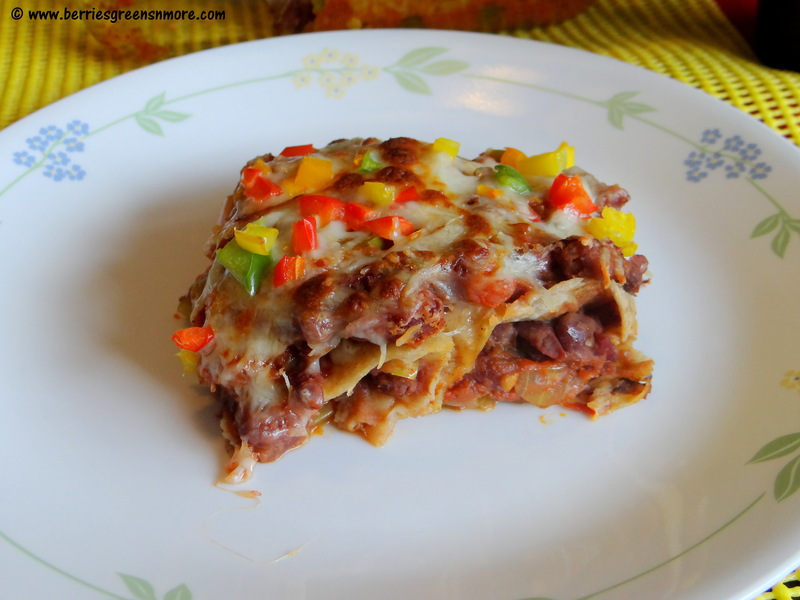 Serve the Roti Bean Enchiladas along with some salad for a perfect lunch or dinner. 1. 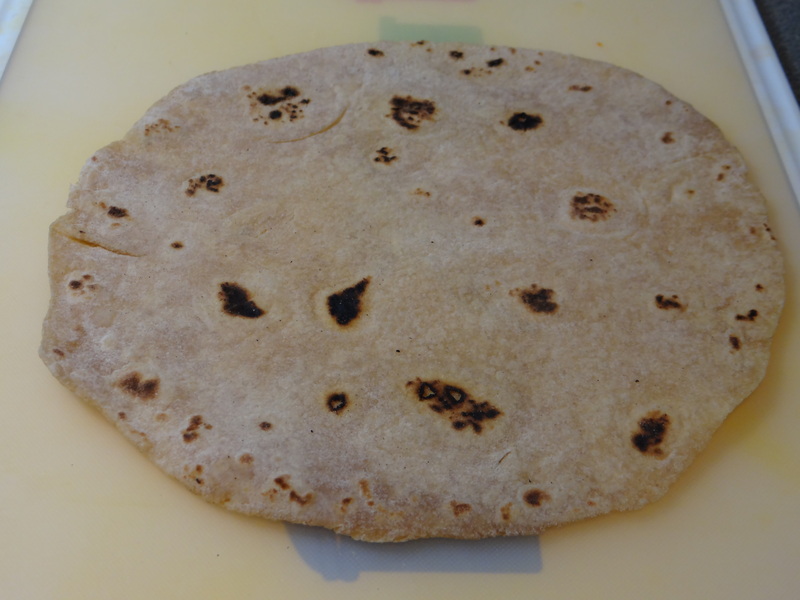 Instead of homemade rotis or leftover rotis , store bought tortillas can be used. 2. 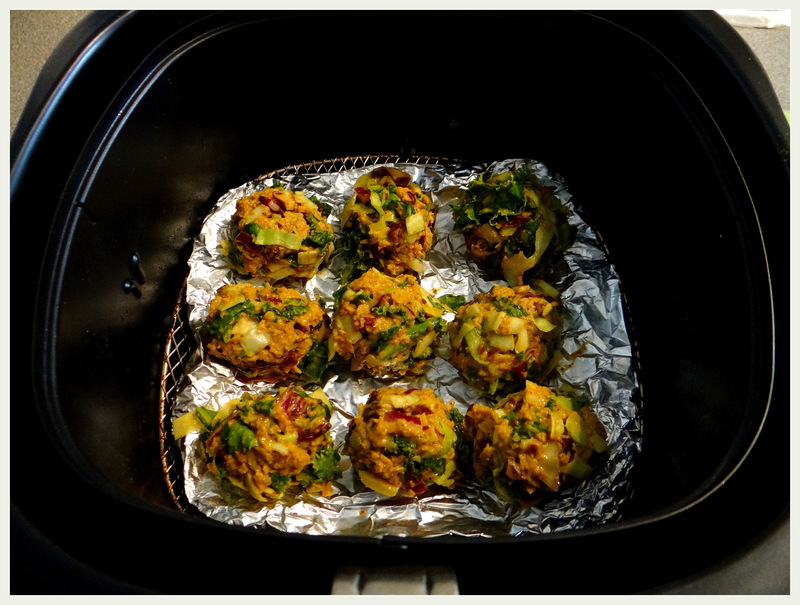 You can also add in some broccoli and zucchini or any veggie of your choice. 3. 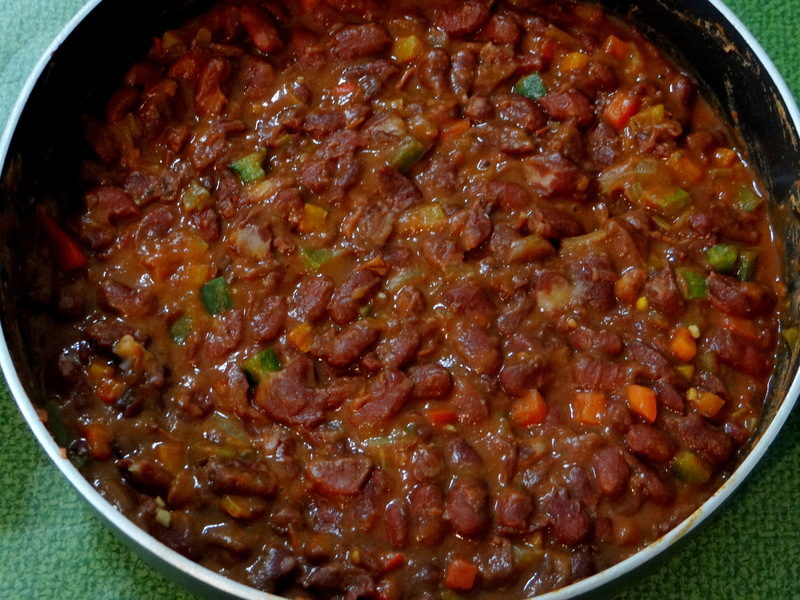 Canned Red Kidney Beans (Rajma) can also be used. 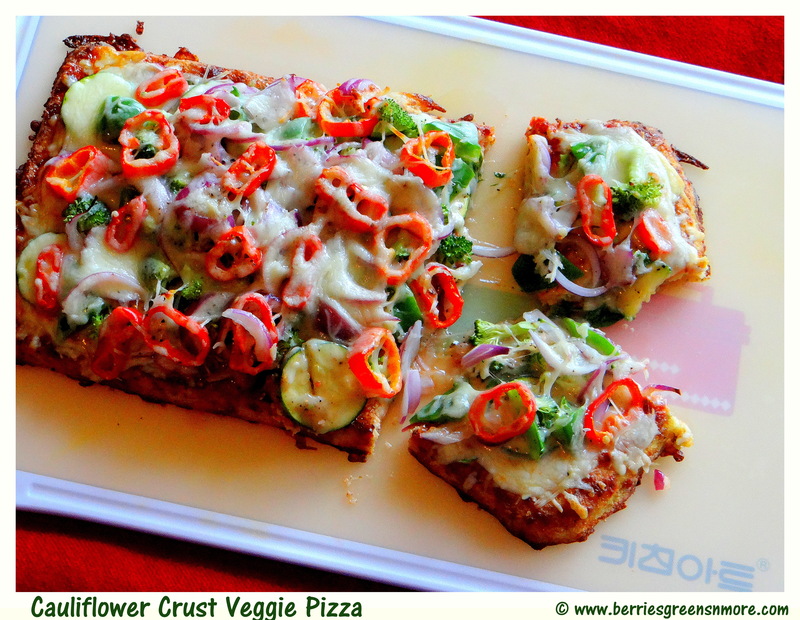 This is the Best No Flour Veggie Pizza you will ever make. The secret ingredient is that the crust is made of Cauliflower. Yes you heard me right Cauliflower !! You must be thinking this is joke but No I’m making that claim and sticking to what I say. This indeed is the best pizza you are ever going to have. 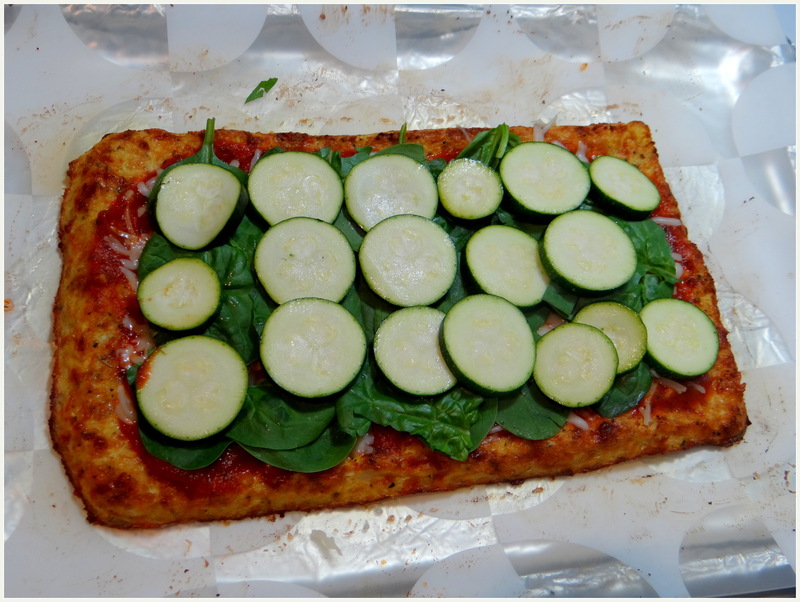 The idea behind making this cauliflower crust pizza is by doing tons of research online. The whole idea of using cauliflower is a total new quest for me. 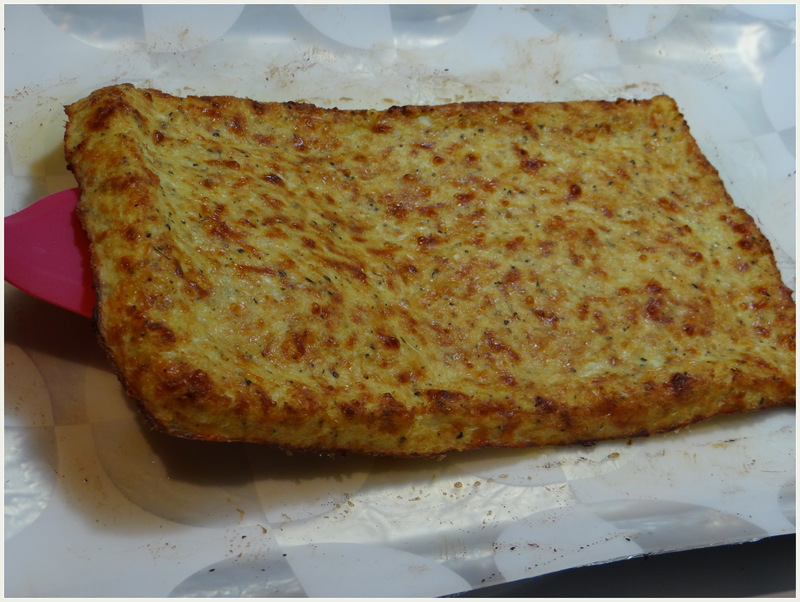 But this perfect recipe was derived after lot of trials and failed attempts at the cauliflower crust pizza before. Most times, the flavor was amazing but the texture was crumbly and falling apart. The solution to the best crust that doesn’t fall apart and taste like a bread crust is in the squeezing and draining the excess moisture from the cauliflower. And, yes you can slice it and pick it up like a real pizza slice. It’s a guilt free recipe without the all-purpose flour (white poison thats what I call it) and wheat free. The only calorie intense ingredient is Cheese. Okay, it’s a weekend treat for me and my tummy is happy since it is getting fed with all the amazing nutritious veggies so a little cheese here and there is allowed. 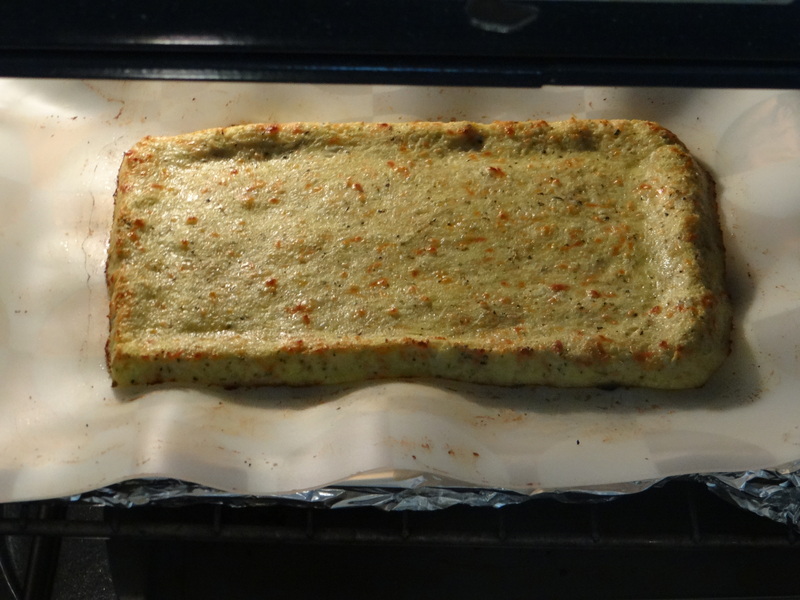 The best part of this recipe is picky kids who donot like veggies won’t even understand the crust is not the traditional bread and this becomes an ideal way for mommies to sneak in veggies into their diets. What are you waiting for? Lets get started !! 4. 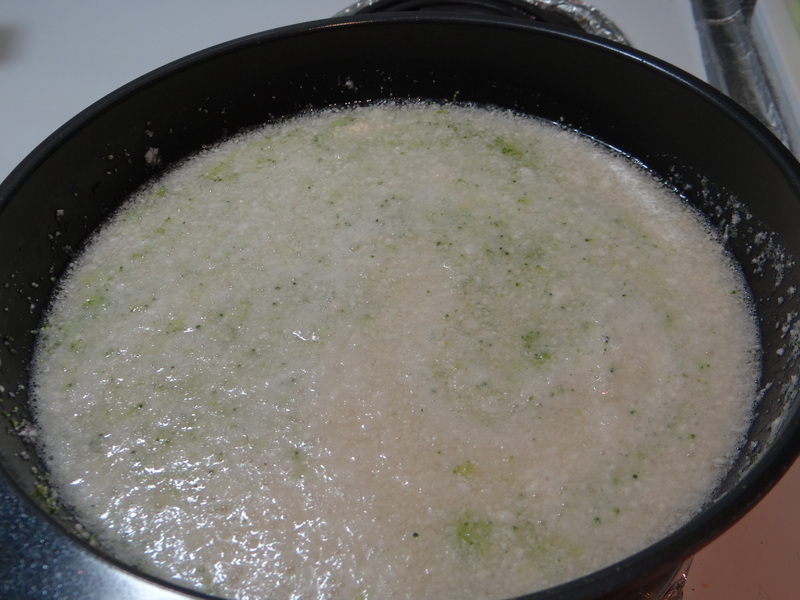 Boil the riced cauliflower in a large pot for 5 to 7 minutes until the cauliflower is nice and tender. 5. Strain the cauliflower in a strainer and wait for the cauliflower to come to room temperature. 6. 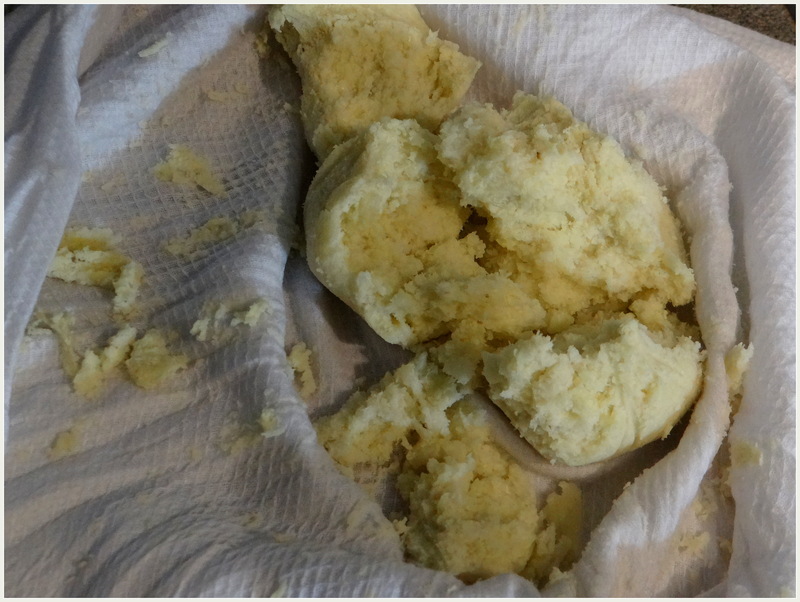 Place the cauliflower on a clean washed kitchen towel and squeeze out as much water as you can. This is a crucial step in this recipe, since the crust will hold its shape and not fall apart only when the water is completely squeezed out. 7. 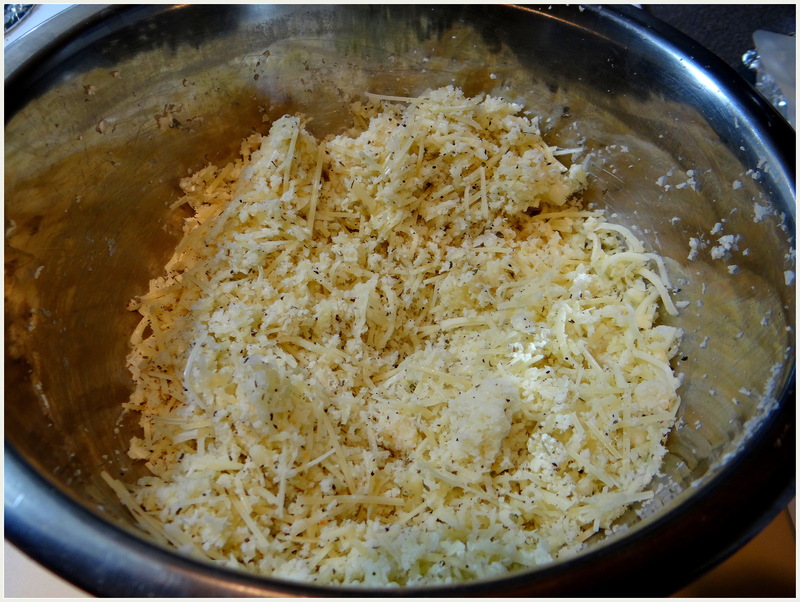 Transfer the cauliflower to a large mixing bowl and add in the beaten egg, 1/3 cup mozzarella cheese, 2 tablespoon parmesan cheese and the dry seasonings. Combine everything together. 8. 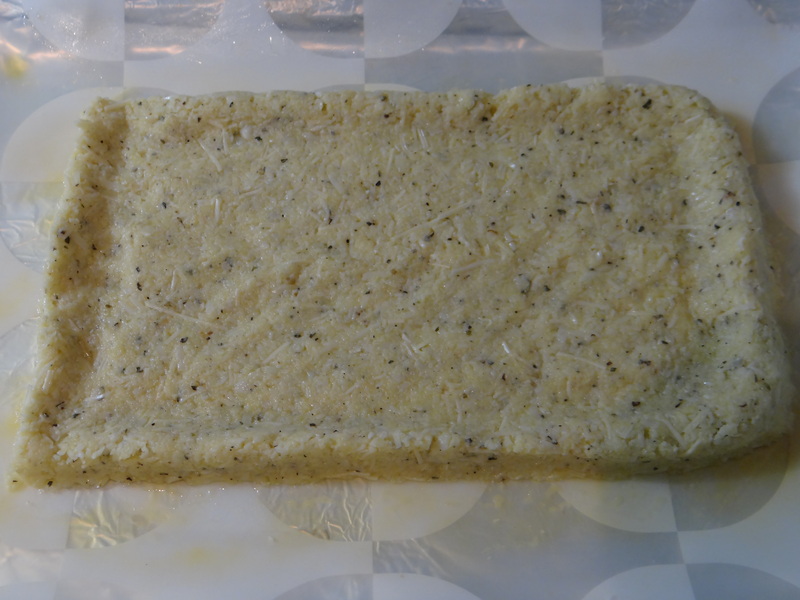 Transfer the mixture to the baking tray and shape into a thick rectangle or a thick cylindrical disc of your choice. Do not forget to make the edges a little higher to give it bread crust effect. Brush little milk on top of the crust to give it a brown effect. 9. Bake it in the oven for 25 to 30 minutes until golden brown. 10. 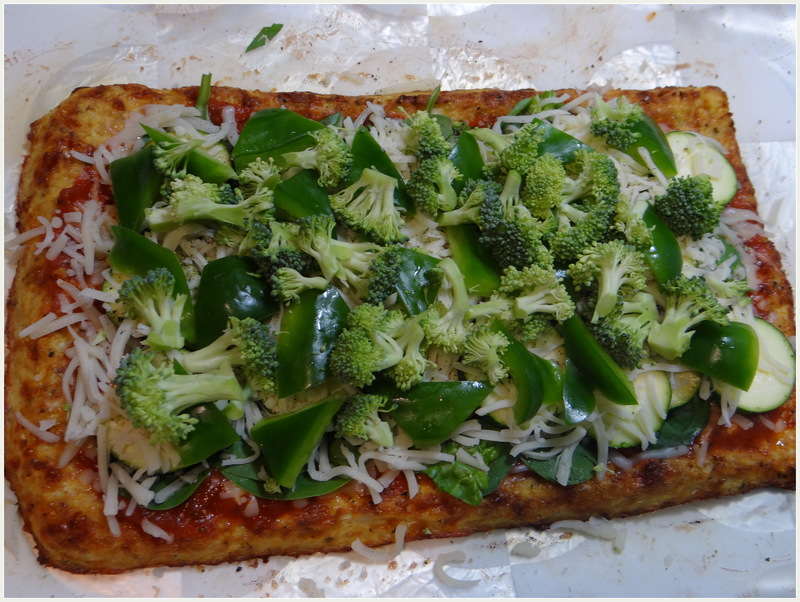 Top the crust with pizza sauce, veggies and ¾ th cup mozzarella cheese and bake again for 10 minutes or until the cheese has melted. 11. Let it cool for 10 minutes and cut into slices (mine came to about 6 slices). Enjoy Guilt free !! Note: Approx. 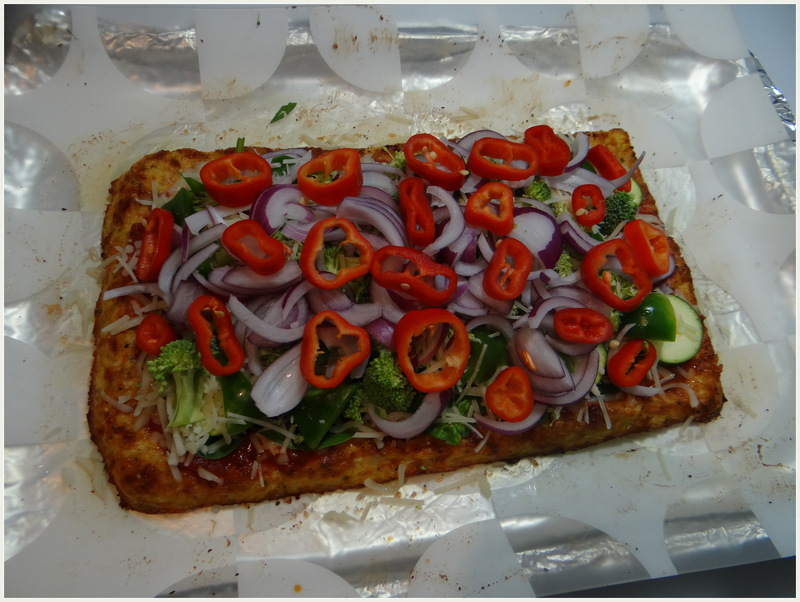 400 calories per serving of 2 slices which is just ½ the calories of a regular flour crust pizza. Thank you for all your love & support. Really sorry for the long HIATUS. It’s been a long time since I have posted anything in BerriesGreensNMore. I have been very busy over the last few months with other work. I promise to be back in the next few weeks. Say tuned. You must be wondering Rice but no grain version. Confused….Let me break the suspense. This ‘rice’ isn’t rice at all. 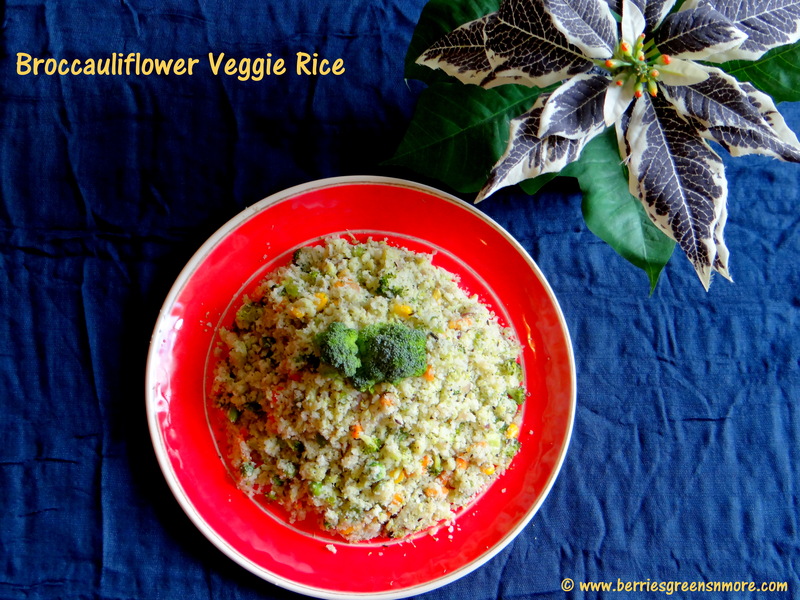 It’s a super big hunk of Cauliflower and Broccoli that’s been grated fine into a rice texture. 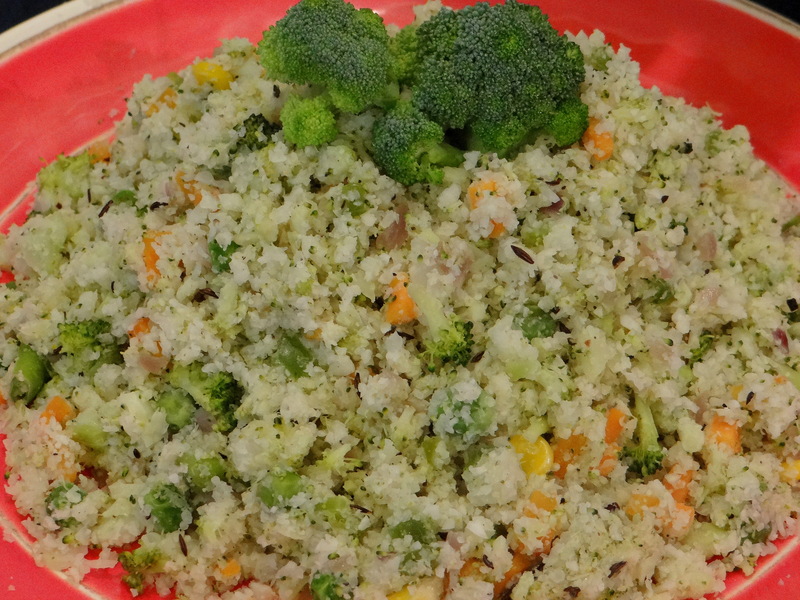 To give the broccoli and cauliflower a fried rice resemblance, it’s important to extract the excess water from the grated vegetables prior to cooking. 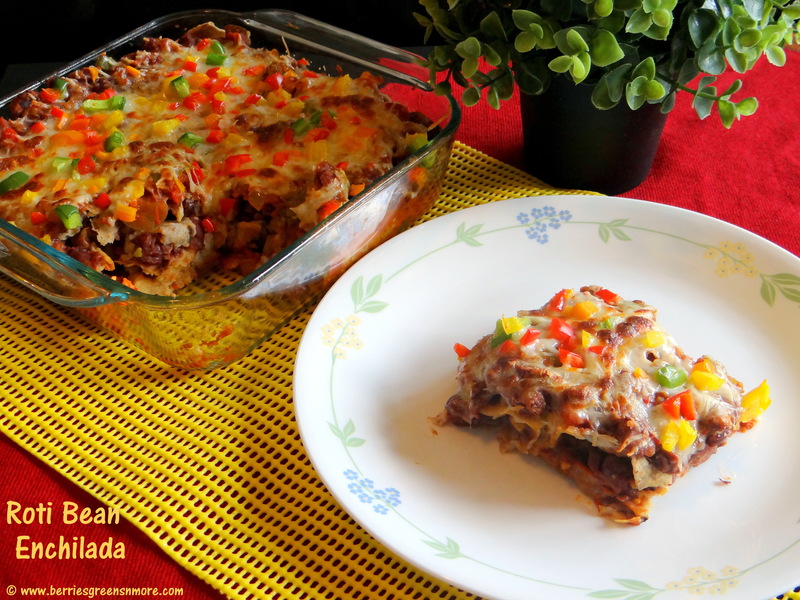 This dish is perfect for people on a low carb diet or who want to enjoy nutritious food. 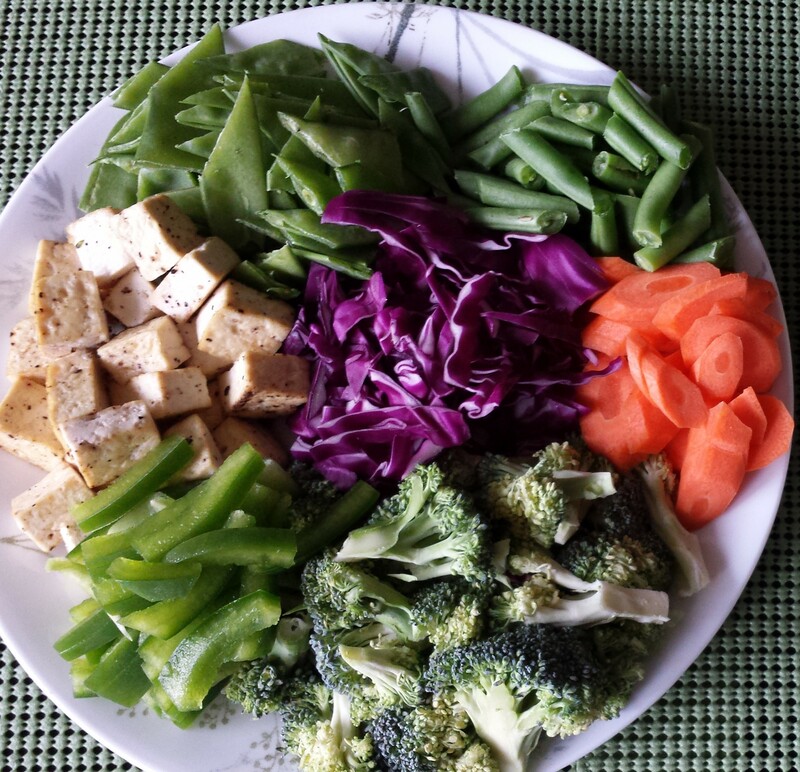 This is a good way to sneak in some veggies in your child’s diet. This rice but no rice dish is flavorful and loaded with lots of veggies and a hint of aromatic spices. Well, if you’re a rice fanatic, this cauliflower rice recipe will be a tasty and satisfying non-grain alternative. In fact, when I first made this I was amazed by the taste and texture that I swapped it with my regular Indian breakfast menu. I was first introduced to the amazing concept of a no-grain rice by my fitness expert. It’s since become a favorite of mine! 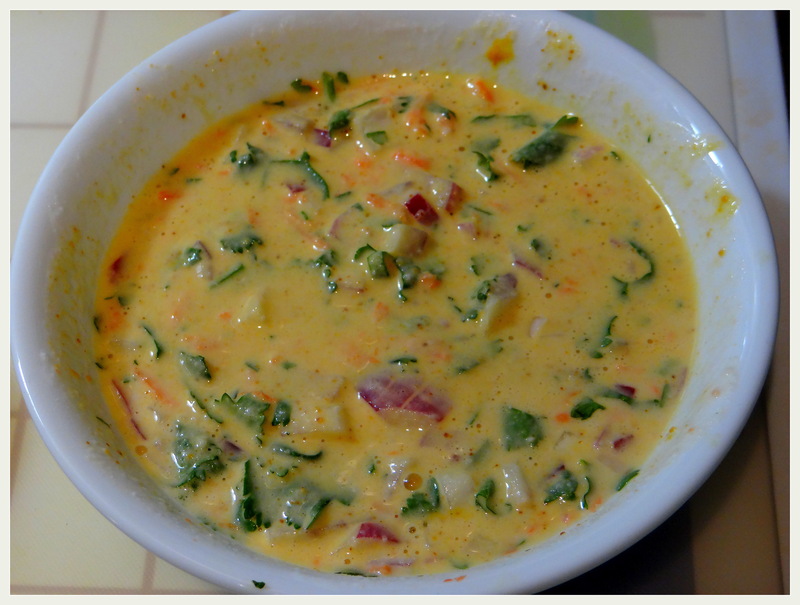 I have given the original recipe a little Indian twist to satisfy my taste buds. Believe me, you will go Ga Ga over this dish. So, lets start cooking !! 2. In a deep bottom pan, heat water till bubbly and switch off the flame. 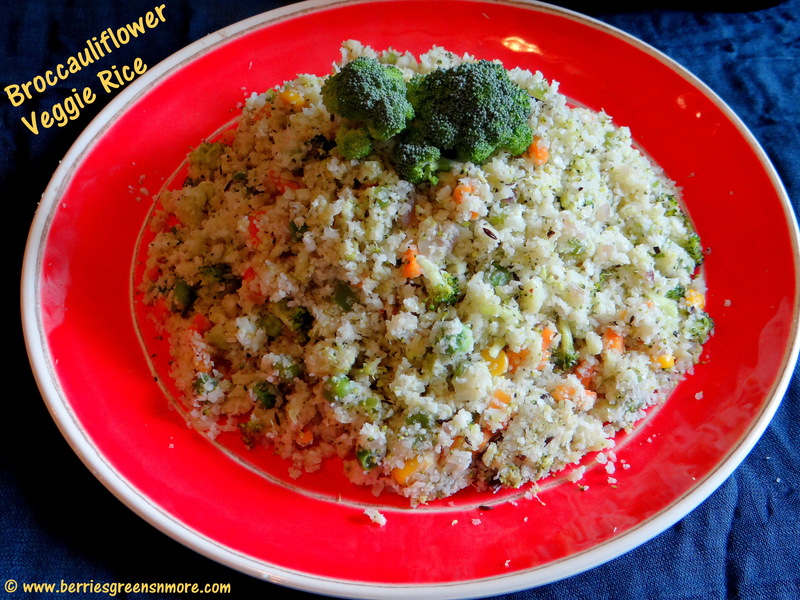 Put in the riced cauliflower and broccoli into the boiling water and close the lid of the pan. Let it sit for 5 minutes. Do not allow it to sit too long or else the cauliflower and broccoli will be over cooked and will turn out to be mushy consistence instead of grainy. 3. Drain the water from cauliflower and broccoli by placing them on a strainer. 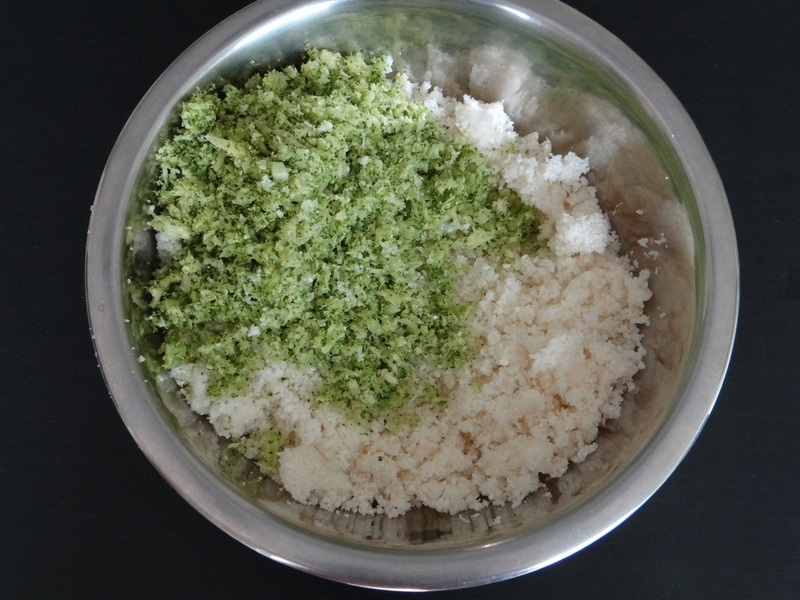 Now, remove the excess water by placing the riced cauliflower and broccoli on a absorbent paper or kitchen towel and squeeze off the excess water. 4. This excess drained water can be stored and used for making soups. It is very nutritious. 5. In the same deep bottom pan, heat olive oil. 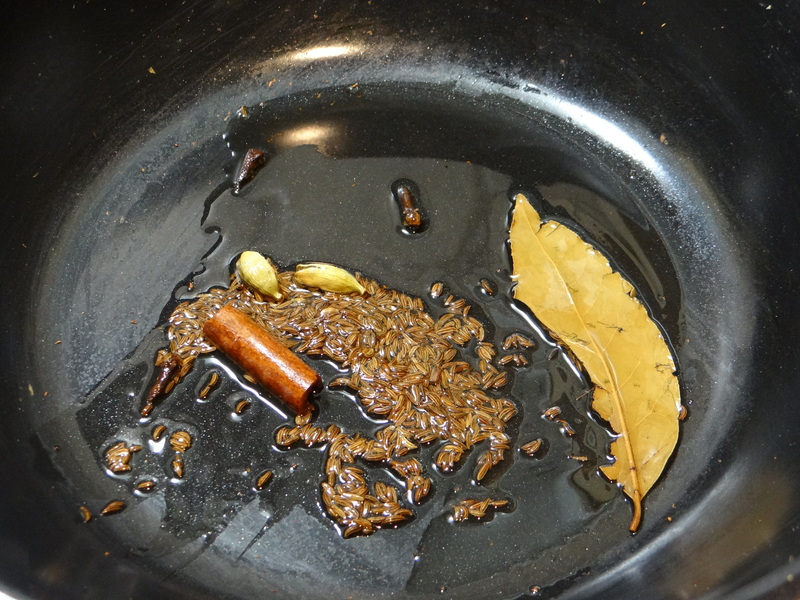 When the oil is hot add in the cumin seeds and when the cumin seeds change color, add in the bay leaf, cinnamon stick, cardamom pod, coves and stir in for 30 seconds. 6. 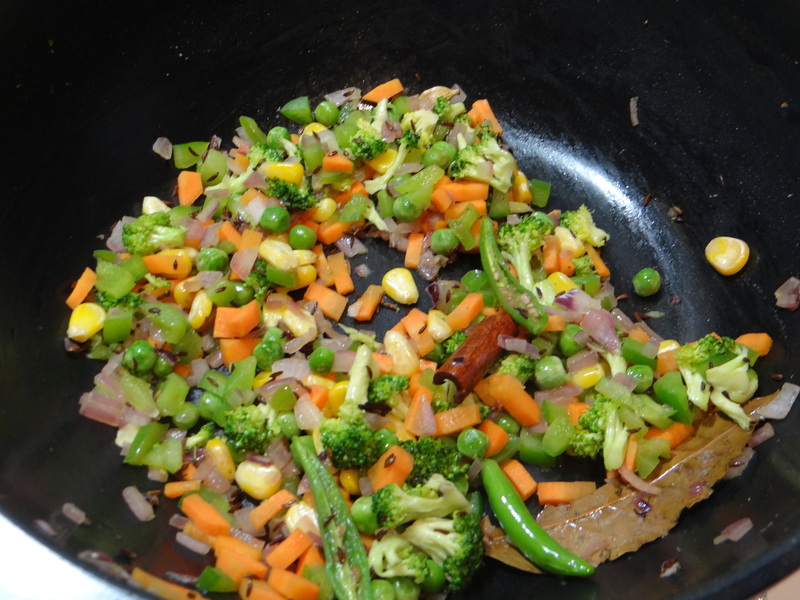 Now, add in the grated ginger , green chillies, chopped onion and the remaining veggies. Stir in for 2 minutes till the veggies turn out to be half cooked. 7. 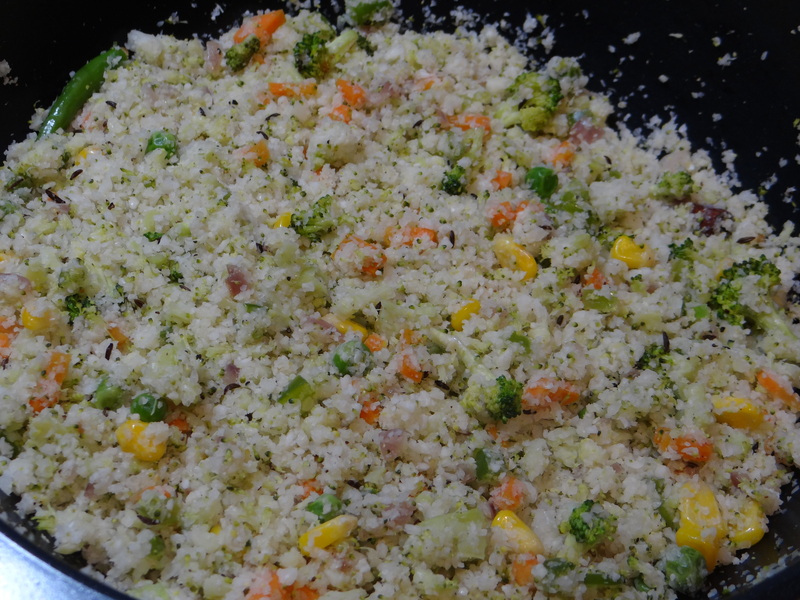 Add in the riced cauliflower and broccoli and stir in on high heat for 1 to 2 minutes so that if there is any excess water, then it will get dried off and you will get this amazing fried rice or couscous or upma consistency dish. 8. 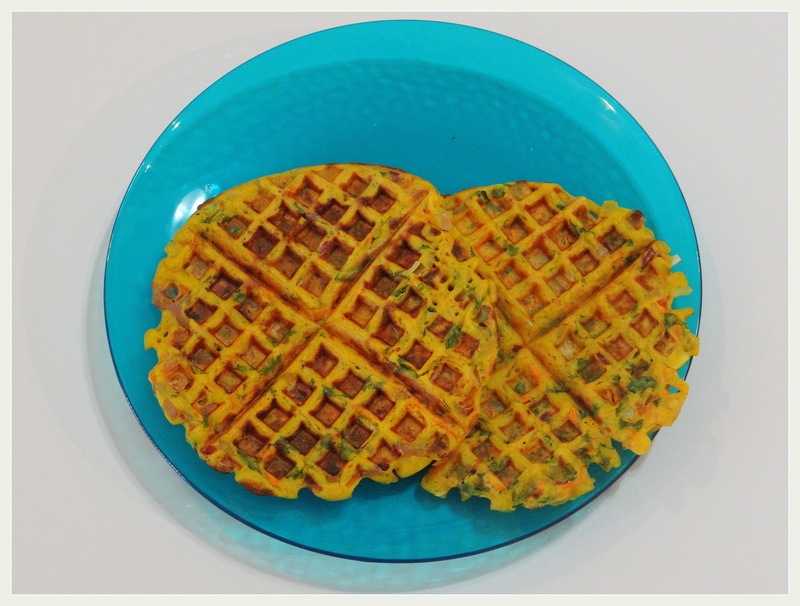 Serve it hot hot and enjoy it as a substitute to your regular rice or swap it with your breakfast menu. 9. 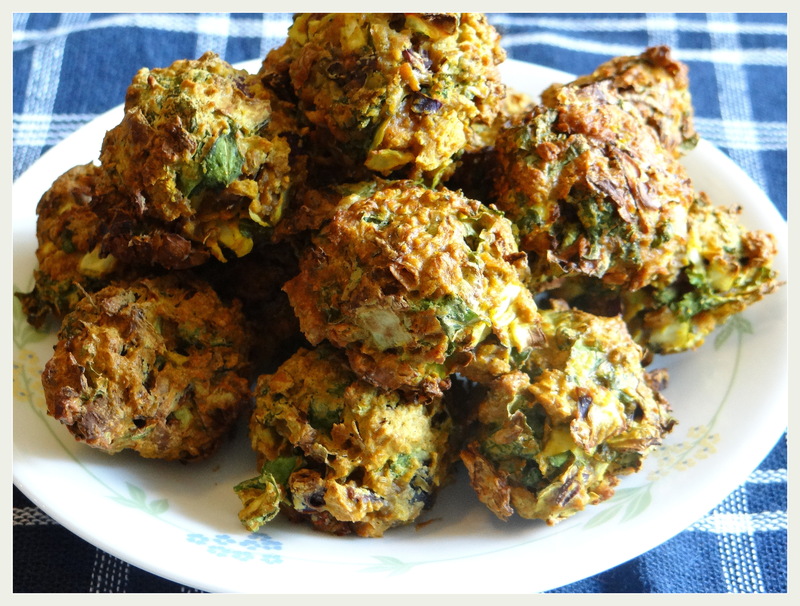 I love, to have it as a replacement to Rice with some curried lentils or stir fry veggies on the side. A cup of riced cauliflower and broccoli has only 25 and 31 calories versus white rice 204 calories. 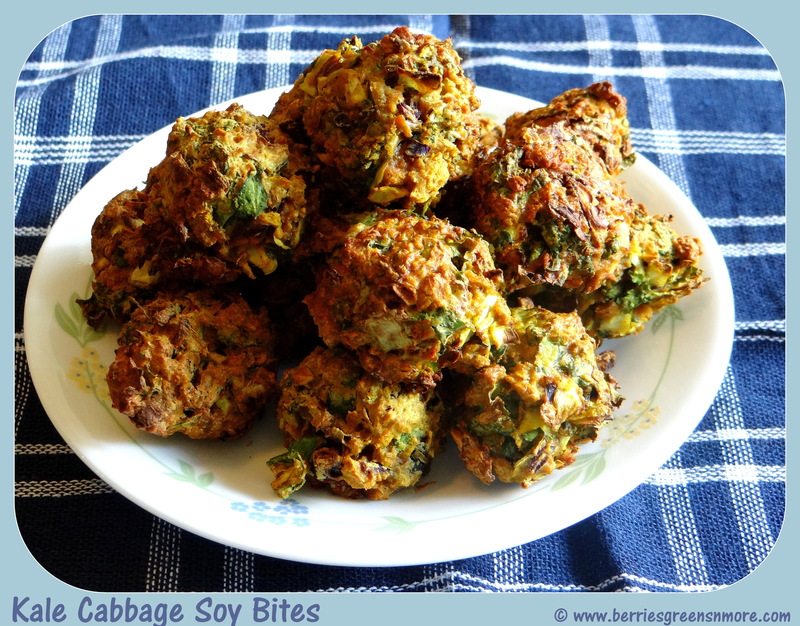 Kale Cabbage Soy Bites are a high power packed protein snack which is perfect for anytime snacking. My husband just loves this snack and can just have countless of them. They are also perfect as a party starter. Kale, Cabbage and Soy make it a wholesome meal in itself. Being Air Fried rather than deep fried makes them even more nutritious and healthy. This is perfect for Vegans and Vegetarians who are always on the lookout for different ways to add more protein to their diet. I’m sure even a non-vegetarian would love this snack. These bites can also be packed for school lunch box. Serve them hot with a chutney or dip of your choice. Did you know: Kale is a super healthy green King. 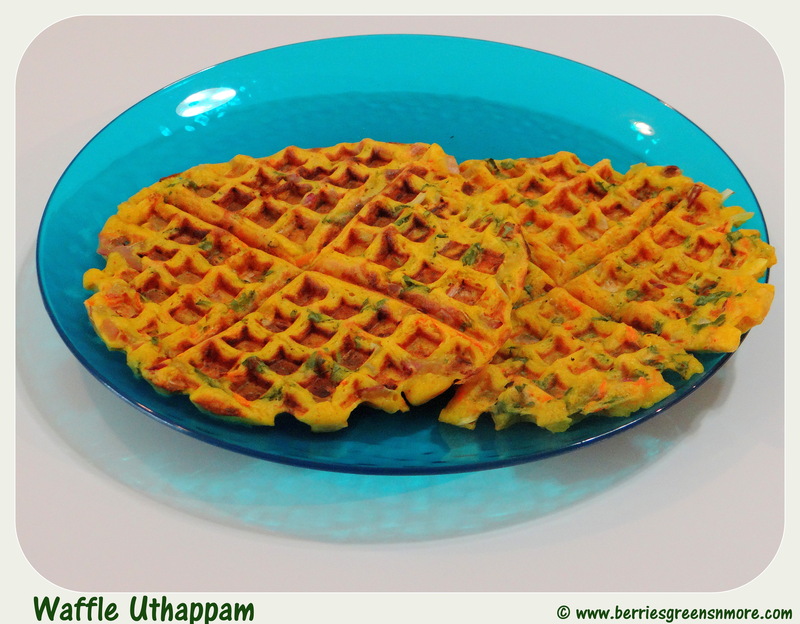 Its loaded with vitamins, minerals and antioxidant properties. Green Cabbage also contains vitamins, minerals and helps in controlling blood pressure, helps lose weight in a healthy way. Red Cabbage contains essential dietary fibre, vitamins and minerals. Promotes good health and boost the immune system. Soy Chunks/ Granules are perfect for vegans and vegetarians who forgo the consumption of meat and who are always looking for alternatives to meet their nutritional needs. 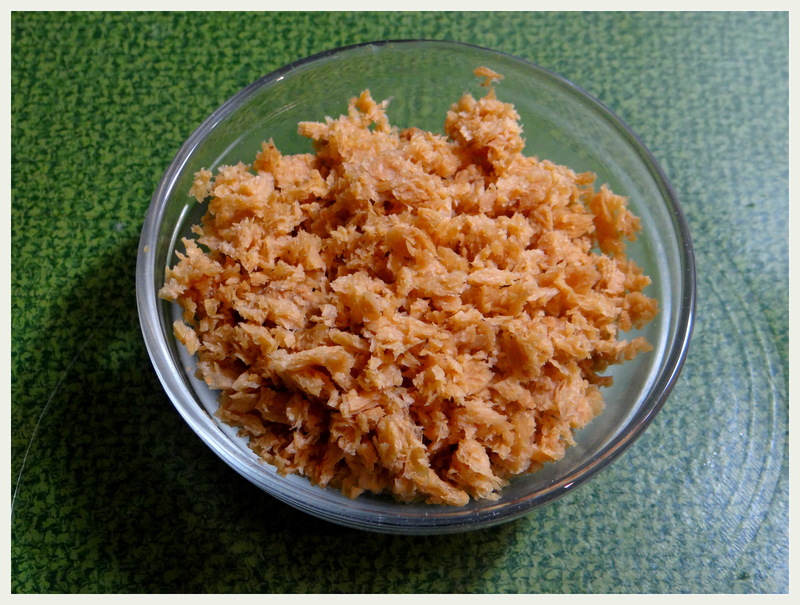 Soy chunks are made from soy beans and they work well as a meat substitute. They are power packed with protein, calcium and iron. Nutritional Yeast is perfect for vegans since it is an alternative to regular cheese. 1. 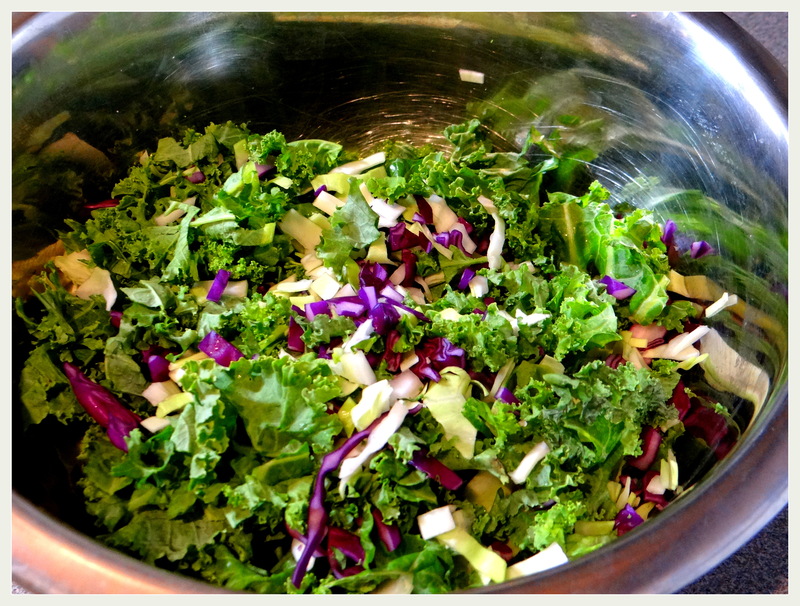 To prepare the Kale Cabbage Soy Bites, first soak ½ cup dry soy chunks in warm water for 15 minutes. 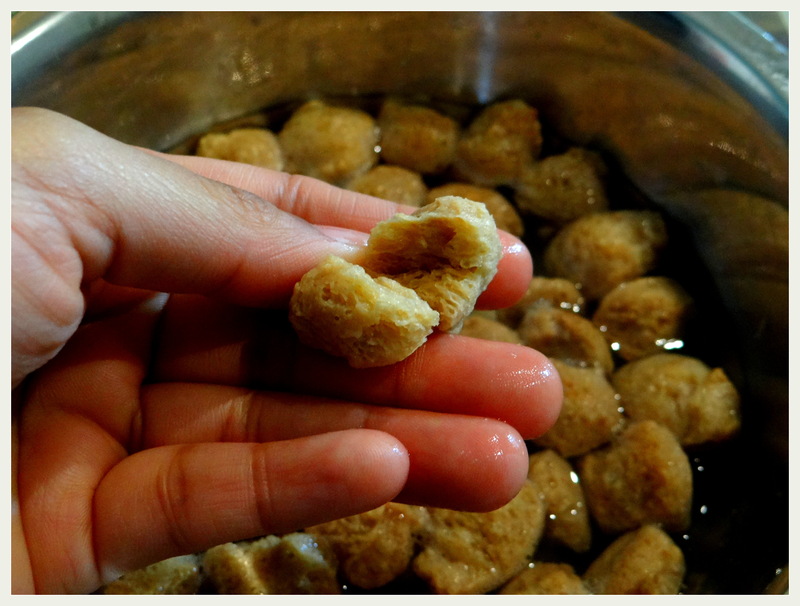 When the soy chunks puff up, squeeze out all the excess water by pressing the chunks between the two palms and chop it fine in a blender or a food processor. 2. 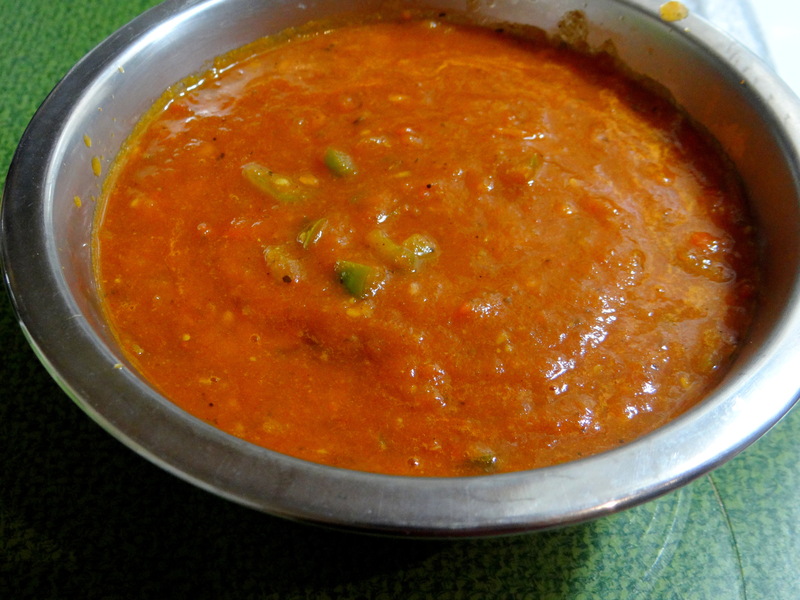 In a large mixing bowl combine all the vegetables, dry masala, flour, 1 teaspoon olive oil and bind together to form a dough like mixture with the help of some water. 3. 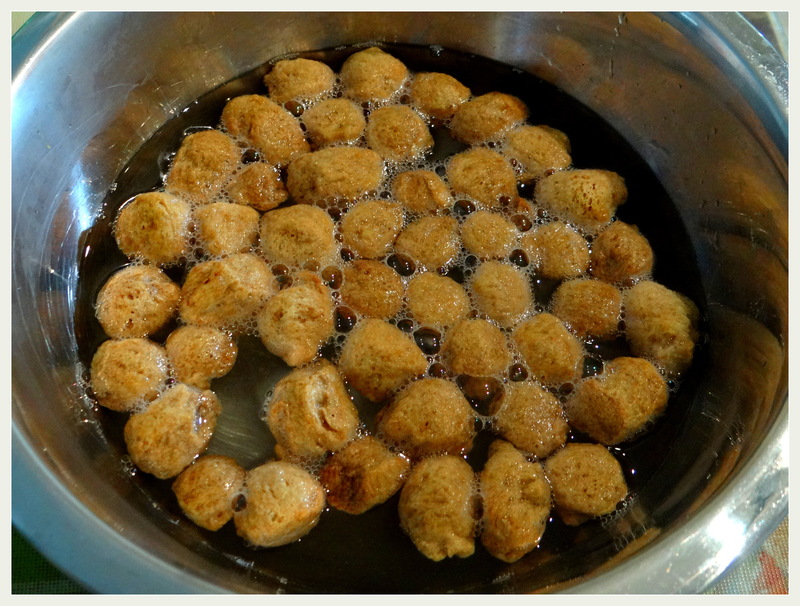 Divide the mixture into equal portions and shape each portion into small size balls. 4. Check the spice and salt to suit your taste. 5. 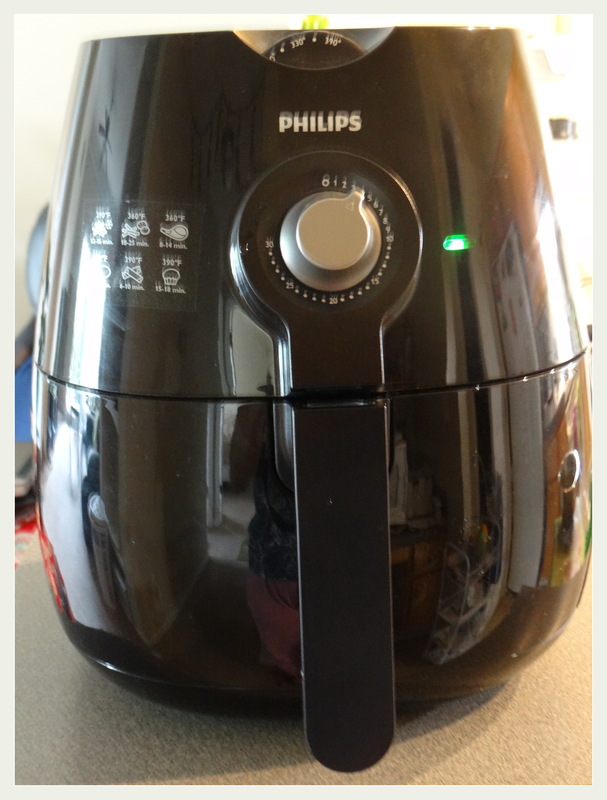 Preheat the Air Fryer to 390 F or 200 C (approx.). Place the Kale Cabbage Soy Bites into the Air Fryer and gently brush them with the remaining 1 teaspoon of olive oil. Bake them for 15 minutes or until outer layer turns crisp and brown. 6. 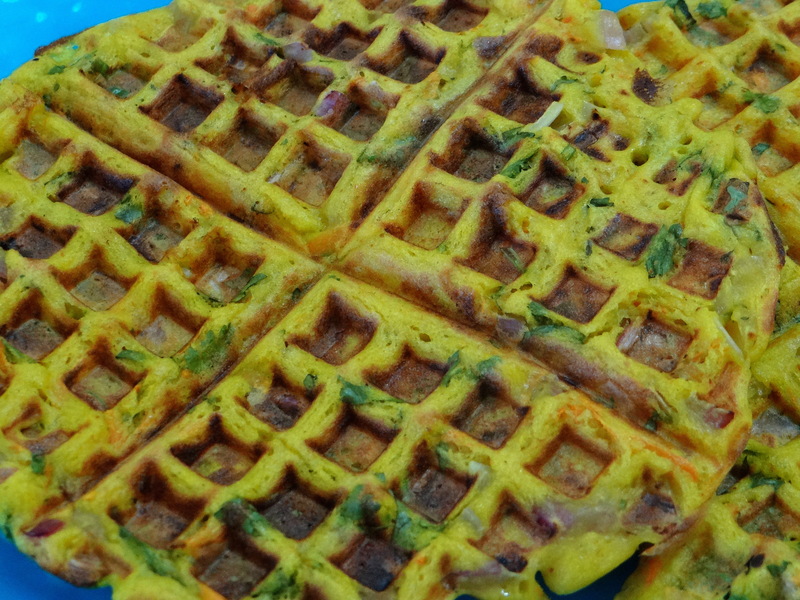 Alternatively these bites can also be baked in preheated oven, Paniyaram Pan or even shallow fried according to your preference. 7. 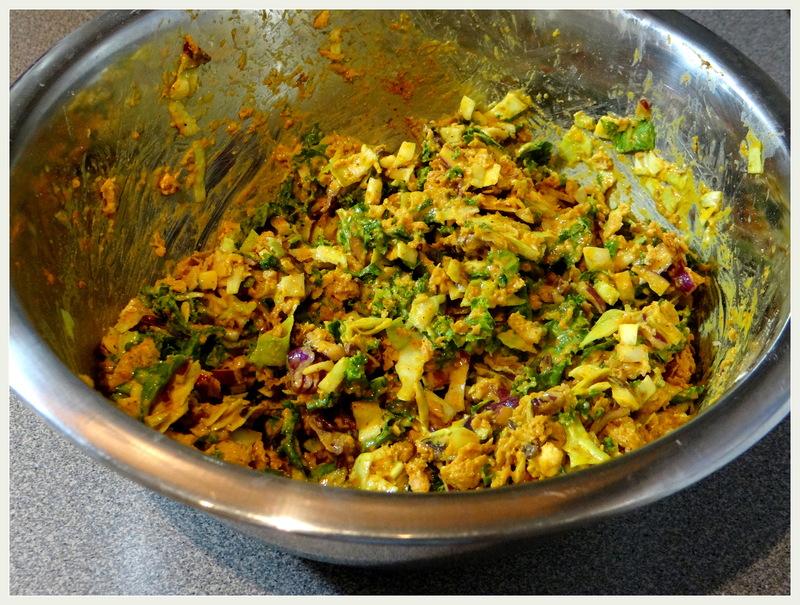 When done, transfer the Kale Cabbage Soy Bites to a serving platter and serve hot with chutney or dip of your liking. The weather is getting warmer here and my taste buds are craving for some Ice Creams. But if you are lactose intolerant, Vegan or just trying to eat healthier, then all that dairy, cream and sugary store bought ice creams can really get in the way of reaching your health goals. Why fear? 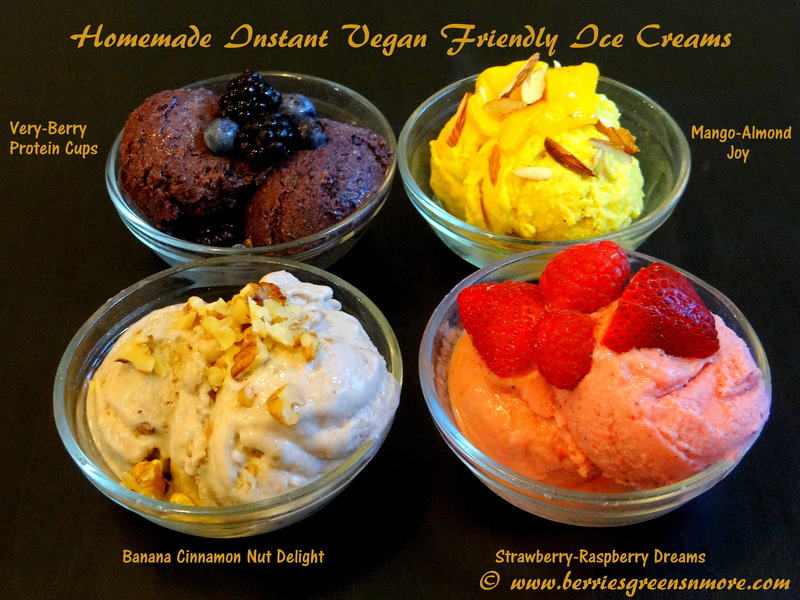 with just some simple alternatives we can make several ice creams that are not only healthy, low calorie, dairy free, gluten-free, sugar-free but also satisfying, guilt-free and delicious. Below are my four (yes you heard it right four !!) varieties of ice cream alternatives that are made with fresh fruits ,natural sugars and ‘NO’ cream, gelatin, eggs, nasty sugars. 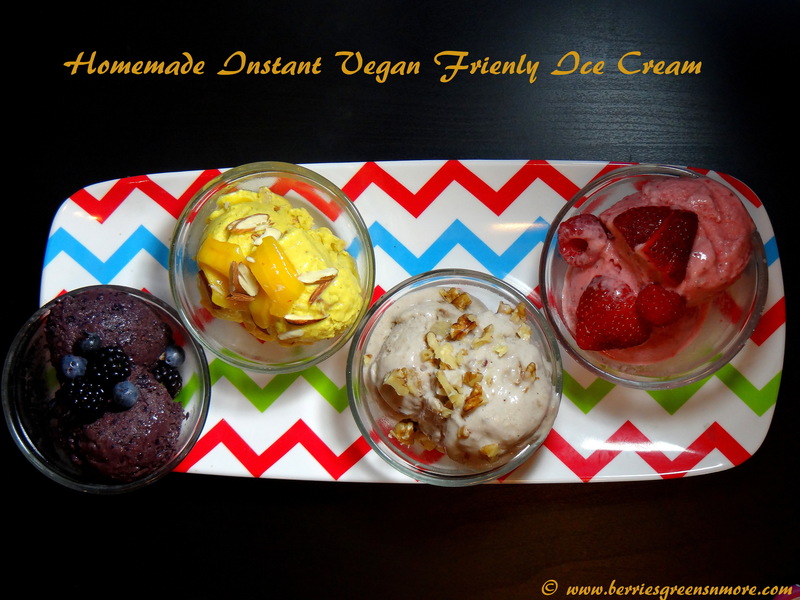 Ice creams made at home add in a long list of nutritional benefits. All you require is a blender, fresh frozen fruits and a dairy-free liquid base. Lets get started !! Peel the bananas, cut them in small dices and put them in a freezer bag and freeze them for 5 hours. 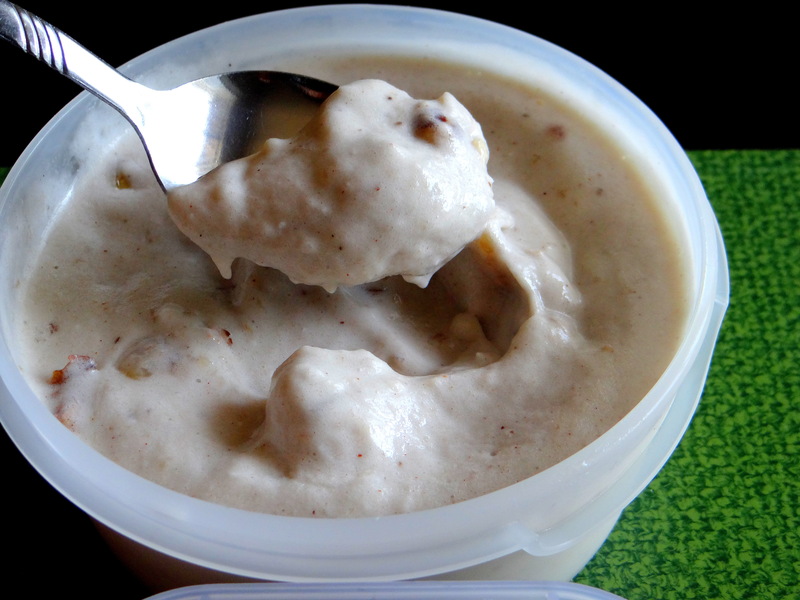 For making the ice cream, in a blender add the chopped bananas, cinnamon powder and coconut milk and blend till smooth. Mix in the nuts. Freeze the mixture for 6 to 8 hours in a container. Just before serving top it up with some roasted nuts. Freeze the strawberries and raspberries in freezer bag for 5 hours. For making the ice cream, in a blender add the frozen berries, coconut milk and maple syrup (some berries can be less sweet) as per your sweet preference and blend until smooth. 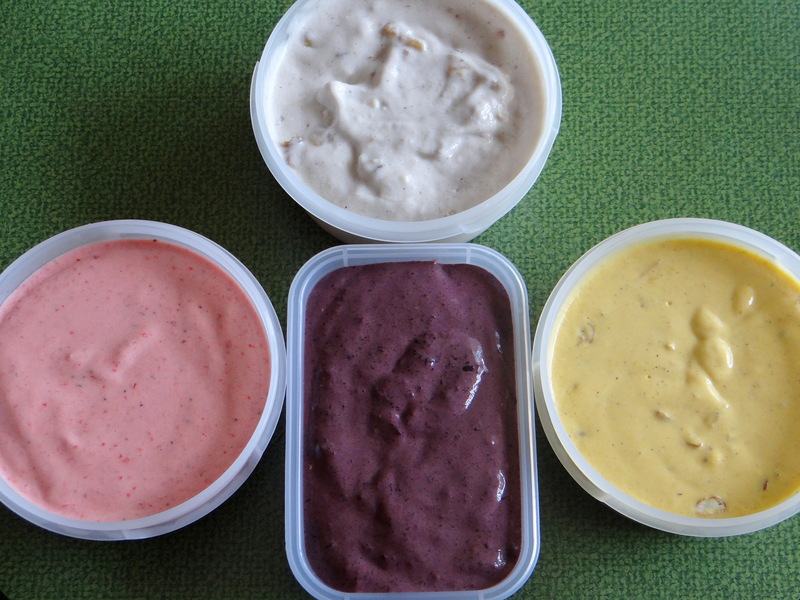 Freeze the mixture for 6 to 8 hours in a container. Just before serving garnish it with some fresh berries. Freeze the chopped mangoes in a freezer bag for 5 hours. For making the ice cream, blend the chopped magoes, coconut milk, cardamom powder until smooth. Mix in the chopped roasted almond. Just before serving garnish with fresh mango and chopped nuts. Freeze the blackberries and blueberries (I hand picked these berries from a local farm) in freezer bag for 5 hours. For making the ice cream, in a blender add the frozen berries, soy milk, Nutrilte All Plant Protein Powder and maple syrup (some berries can be less sweet) as per your sweet preference and blend until smooth. 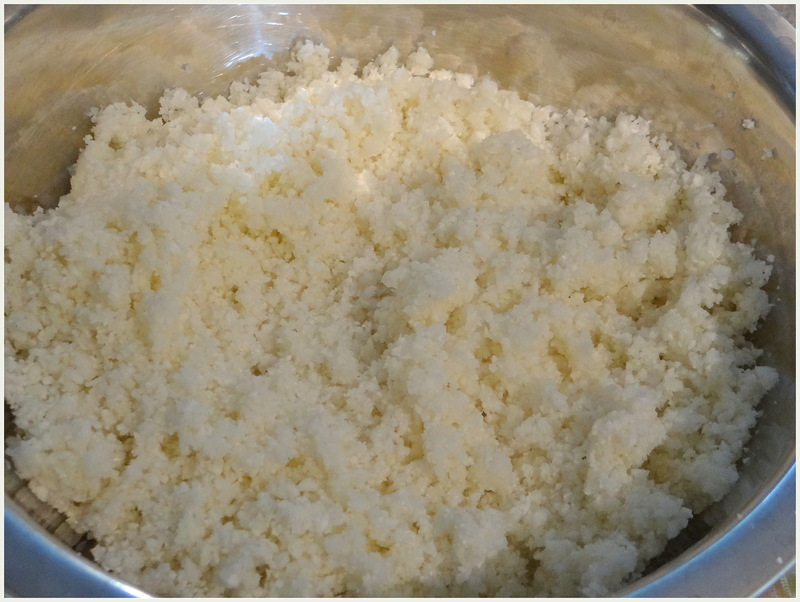 Freeze the mixture for 6 to 8 hours in a container. Just before serving garnish it with some fresh berries. 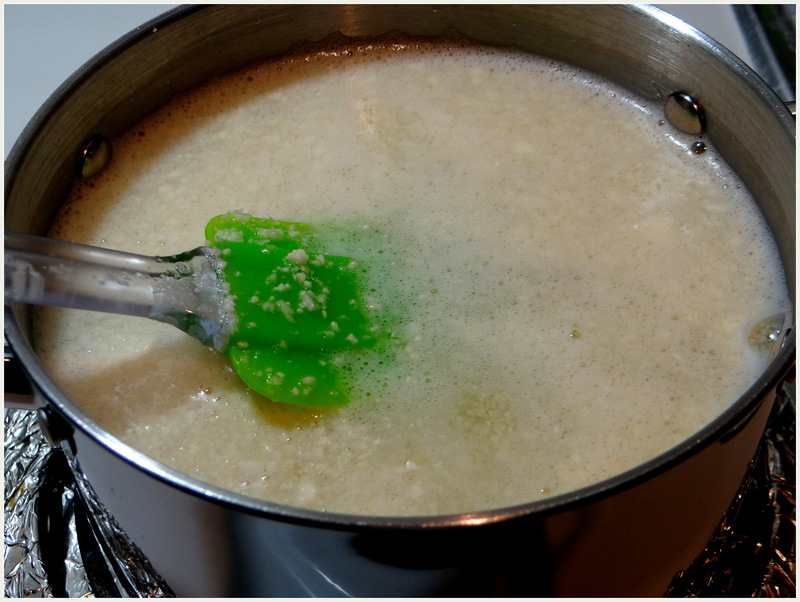 If the mixture gets too thick then a tablespoon or more of the liquid base can be added. If needed the liquid base can be altered as per your preference with Almond, Soy, Coconut Milk. Personally, I feel the coconut milk give the ice cream a creamier texture. Choices of fruits totally depends on personal preferences. Sugar can be substituted instead of maple syrup. If needed, cacao powder can be added to give the ice cream a chocolaty taste. One 12.5 g serving of NUTRILITE All-Plant Protein Powder provides 10 grams of heart healthy protein. It’s 100% vegetarian, dairy free and thus is vegan friendly. 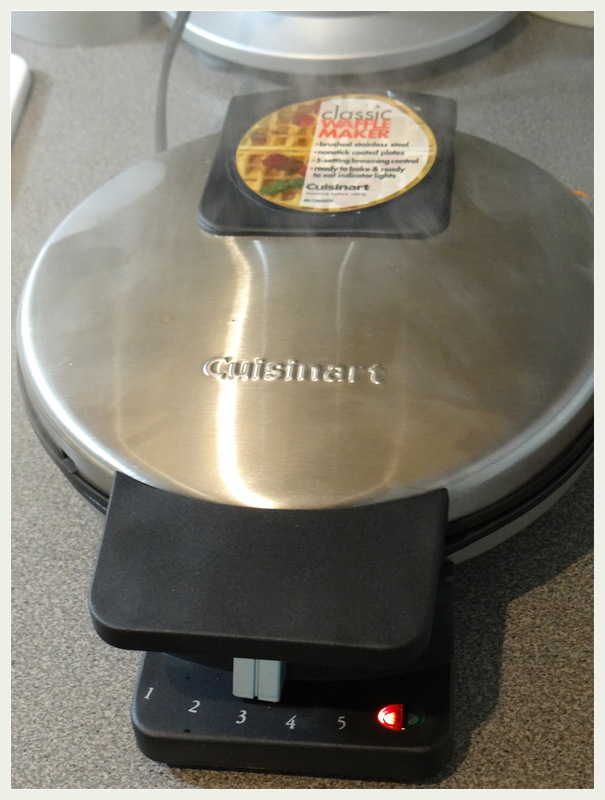 It has low fat ( The highlight of this product is its’ flavorless and can be a healthy addition to any type of sweet or savory culinary preparation: omelets, crèches, home baked bagels, corn breads, muffins, stews, soup, healthy juices, shakes and smoothies. If you would like to give this amazing product a try click on the photo below.